Over the past decade, Facebook has evolved from a social network for college students to a source of information, connection, entertainment — and, sometimes, news — for 1.2 billion people around the world. 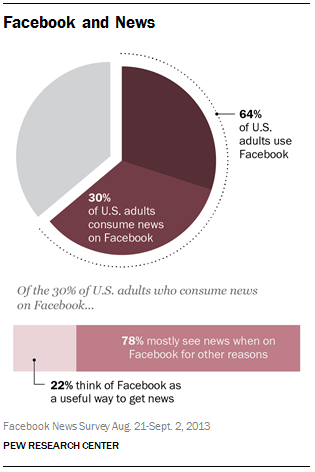 But according to a Pew Research Center report from last year, most Americans who get news via Facebook do so as a byproduct of their other activities there — what one might call “drive-by news”. About half (47%) of adult U.S. Facebook users said they had ever gotten news via the service — equivalent to 30% of the adult population, the survey found. But the overwhelming majority (78%) of that subgroup said they picked up news from Facebook when they were on the site for some other reason; just 4% said Facebook was their most important news source. Facebook news consumers are considerably younger (39) than other adult Facebook users (47). About a third (34%) of Facebook news consumers are ages 18 to 29; nearly four-in-ten (39%) are ages 30 to 49. Unlike Twitter, which has developed into a go-to source for breaking news, only 28% of Facebook news consumers have ever used the service to track an unfolding news story. And even among that sub-subgroup, fewer than half (41%) said Facebook was among the first places they’d turn to keep up with a breaking news event. Speaking of which, just what sort of news are we talking about, anyway? While Facebook news consumers say they see regularly news about a range of different topics, entertainment news seems to stand out: Almost three-quarters (73%) said they regularly saw entertainment news on the site. The next most commonly cited topics: community news (65%) and sports (57%). Facebook, which is constantly seeking ways to encourage people to visit the site more often and stay longer, apparently sees news as a way to deepen what it calls “user engagement.” On Monday, the company rolled out a new iPhone app called Paper that (along with a new, less cluttered interface) employs human editors to recommend articles and blog posts on a dozen newsy topics, from top headlines and sports to technology and the environment.